Here I would like to thanks Francois Lebouncher, Jan Strnad and Dr. Radim J. Vasut respectively for these 3 awesome covers posted from Czech Republic. Thank you very much, my friends! 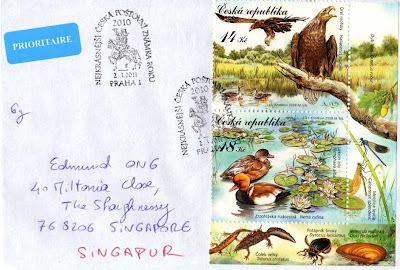 The first cover features stamps from the beautiful "Trebonsko fauna" series. Issued on 28th May 2008, the stamps depict the White-tailed Eagle and Red-crested Pochard. 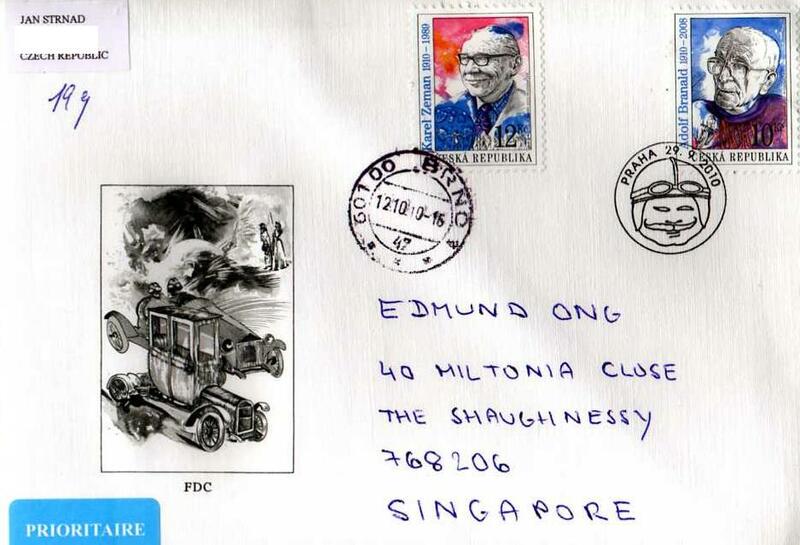 The lovely pair of hand-painted portrait stamps on this second cover belongs to the "Personalities" series, issued on 29 September 2010. They depict Karel Zeman and Adolf Branald. 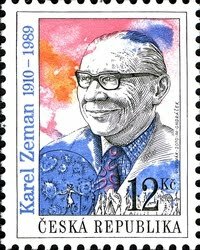 Karel Zeman (3 November 1910 -5 April 1989) was a Czech animator and filmmaker noted for their creativity and for blending live-action with animation and wonderful special effects. Born and raised in Moravia, he started out dressing windows and painting posters. From there Zeman made a few advertising films. In the mid-'40s, he created Mr. Prokouk the Bureaucrat, a popular cartoon character. He also began making short films and experimenting with different types of animation using drawings and puppet figures. Zeman began making feature films such as The Fabulous World of Jules Verne (1957) and Baron Munchausen (1962). ~ Sandra Brennan, Rovi. 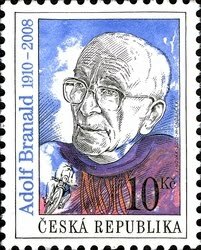 Adolf Branald (1910 - 2008) was a prose writer, playwright and author of children's books. Born in Prague, he was the son of Richard Branald, actor, theatre director and playwright, and actress Marie Branaldová. As a child he lived in Prague, Plzeň, and accompanied his parents who were members of different theatre, operetta and opera companies on their travels. After the war he worked as a press manager at the Transport Ministry, and as an editor with the publishing house Československý spisovatel (1952 to 1959). He became a professional writer after 1960, but ten years later his books were banished by the communist regime. Branald's experience as a writer started when he and his father wrote several plays performed by amateur actors. His knowledge of actors and theatre influenced his works: he wrote realistic plays and books focused on ordinary people. His first independent work was a novel about members of the 19th century travelling theatre companies (Stříbrná paruka, 1947), the last one were his memoirs (Tichý společník) published in 2005 when he was 95 years old. Adolf Branald's works also appeared in newspapers and magazines, on the television (Branald being the author or one of the scriptwriters) and on the radio. 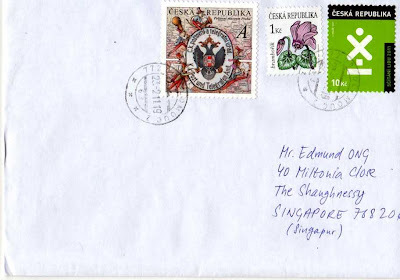 Last but not least, the third cover was franked with 3 beautiful stamps from the "Postal Museum", "Beauty of flowers" Definitive and "Census" series. Over the past few years, I have been quite fortunate to travel quite a bit. There's no doubt Paris is one of the most beautiful cities that I have visited and is definitely one of my favorite. 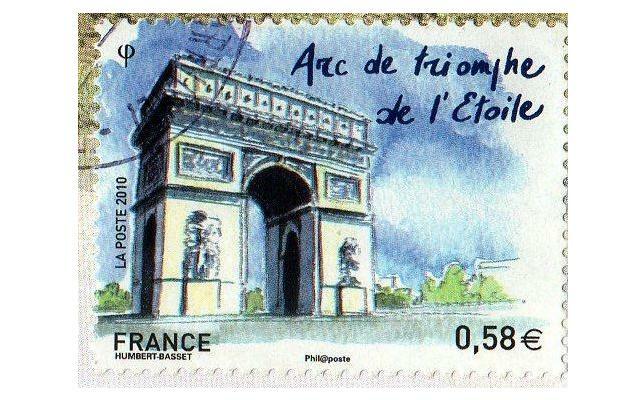 So I was extremely excited to receive this cover as it features 2 stamps which brought back the wonderful memories of my Paris visit back in 2007. Many thanks, Francois Lebouncher!! 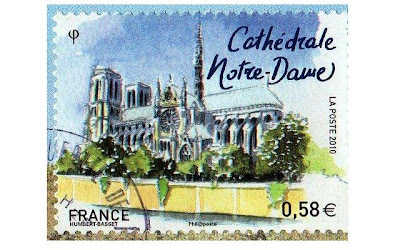 The Notre-Dame de Paris, also known as Notre Dame, is a Roman Catholic cathedral and base of the Archbishopric of Paris. The cathedral, located on the Île de la Cité, which is surrounded by the Seine River, is one of the best examples of French Gothic architecture. A Gallo-Roman temple dedicated to Jupiter once stood on the foundation of Notre Dame, and earlier two Medieval churches. Construction of the cathedral was conducted in three stages beginning in 1163 by Bishop Maurice de Sull during the reign of Louis VII, and took nearly 200 years to complete. The Arc de Triomphe (Arc de Triomphe de l'Étoile) is one of the most famous monuments in Paris. It stands in the centre of the Place Charles de Gaulle at the western end of the Champs-Élysées. The Arc de Triomphe honours those who fought and died for France in the French Revolutionary and the Napoleonic Wars, with the names of all French victories and generals inscribed on its inner and outer surfaces. Beneath its vault lies the Tomb of the Unknown Soldier from World War I. 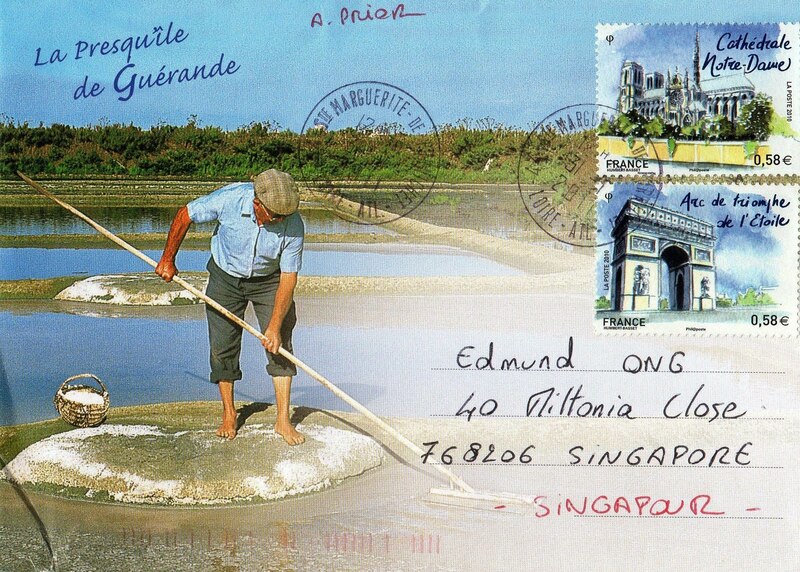 Also worthy of mention is the beautiful envelope itself, showing a man harvesting salts in Guerande, a medieval town located in the West of France, in the French Département Loire-Atlantique. That's all folks! Talk to you guys soon. Adieu!